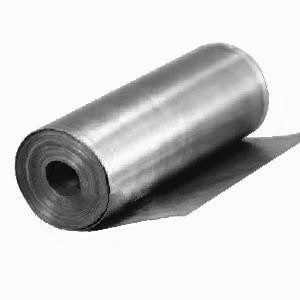 PRODUCT: 12" X 25' ROLL OF LEAD SHEET, 2.5 LB./SQFT, 62.5 LB. ROLL. PRICE/ROLL. * Shipping Leadtime 1-2 business days. Medium-duty sheet lead used for roofing, roofing valleys, drains, acoustical shields, radiation shields, corrosion resistant structures, etc. Meets Federal Specifications ASTM B749-03 and QQ-L-201f Grade C.
Sheets have a tolerance of +/- .005 on thickness and 1/8" on cut sizes. OPTIONS: Also Available in 1 to 4 foot widths and 1 to 25 foot lengths.